How Does Eave Style and Construction Method Affect Ice Dam Formation and Severity? We have discussed the relationship between eave depth and ice dams previously (Case Study #10). Now let’s look into how different construction methodologies affect the likelihood and severity of ice dams in residential and light commercial construction. For obvious reasons, eaves are a central topic in the world of ice dams. After all, that’s where 98% of ice dams occur, with the other slice of happening in areas including valleys, flat roofs and low pitch roof pans. There is a reason why older homes are affected more by ice dams then newer homes. That relates primarily to the nature of how the eaves are assembled. Our grandparents didn’t understand the importance of insulation and ventilation as it relates to the eave. (They were busy thinking about wars and famine). In short, there needs to be enough room between the top plate of the wall and the underside of the roof decking to allow for adequate insulation and ventilation. We know that ice dams are created in large part by the escape of heat from the interior, conditioned spaces of a home into areas where that heat is not supposed to be. Namely, it is not supposed to be in the roof cavity next to the roof deck. Homes with less insulation near the eaves are troubled with ice dams far more than those with adequate insulation and ventilation. In Diagram B, we see an example of common eave construction in modern homes. Notice that the distance between the top plate and the roof deck is quite generous. This is commonly referred to as the heel height. In Diagram A, which shows a hand-framed eave, there is virtually no space for insulation or ventilation. Consequently, heat can easily pass from the room below to the roof system, melting the snow above. Don’t despair if you have old school eaves. 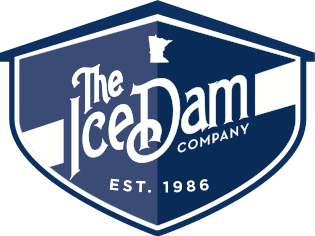 There are options to help prevent or at least minimize the likelihood of ice dam problems in the future. Those can be broken down into two broad categories; Architectural and non-Architectural Solutions. In short, Architectural solutions involve modifications to the thermal performance of the home, including insulation, ventilation and, most importantly, sealing air-leaks into the attic or roof truss cavities. The most effective Non-Architectural solution is simple, cheap and effective. Install a high-quality, self-regulating heat tape system on affected areas. Ask any experienced residential designer, classic architectural styles are difficult to execute with adequate heel heights. Talented designers can pull it off, but they need to think outside the box. High-end, architecturally refined homes don’t look right with clunky, new construction eaves. This entry was posted on Tuesday, March 28th, 2017 at 3:22 pm and is filed under Ice Dam Heat Tape, Ice Dam Prevention, Ice Dam Removal, Ice Dams, Misc., Ice Dams: General Info, Water Damage. You can follow any responses to this entry through the RSS 2.0 feed. Both comments and pings are currently closed.